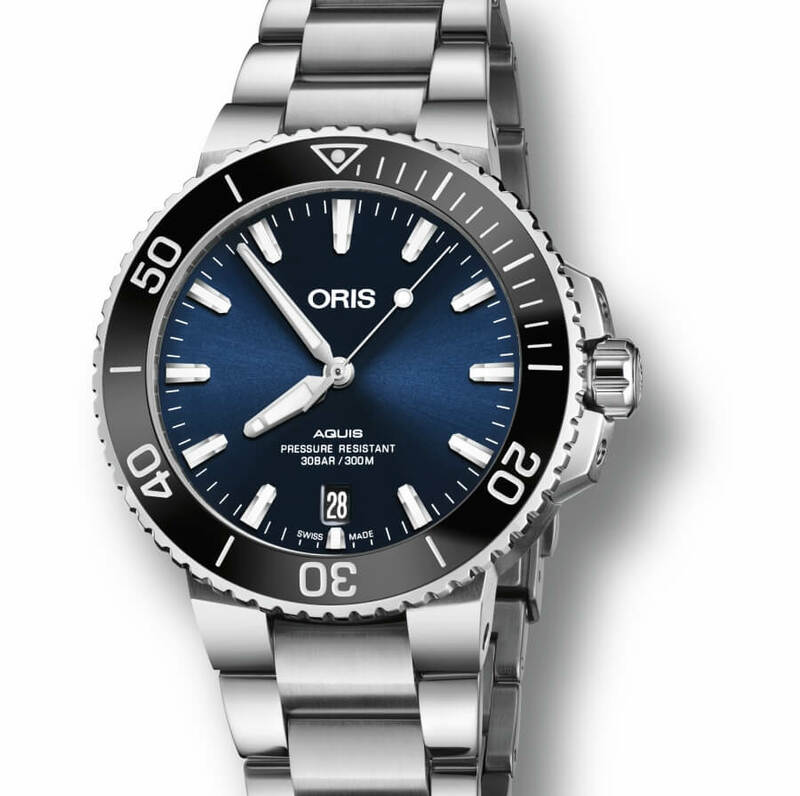 The Oris Aquis Date is one of the most recognisable watches in the Oris collection. 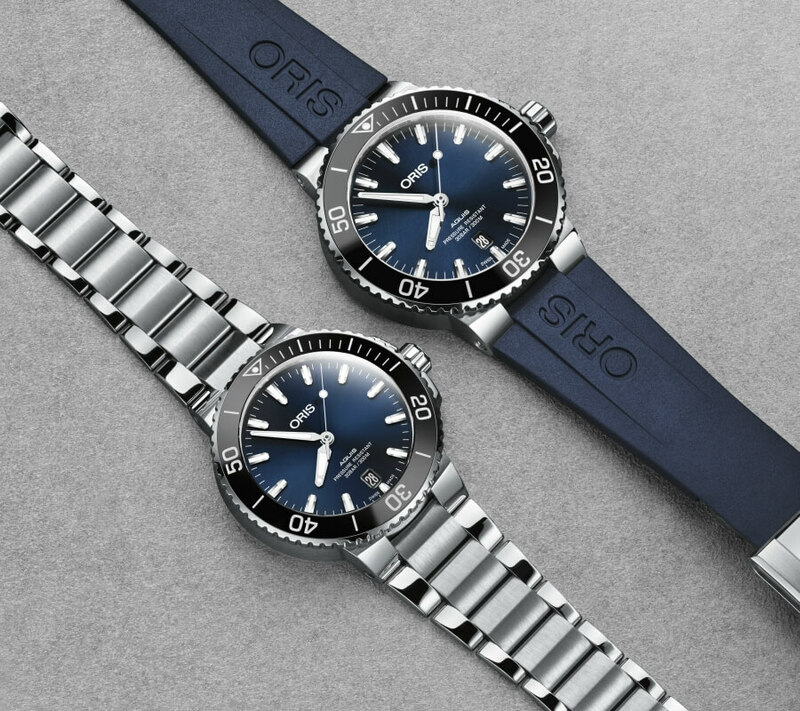 This year, Oris is pleased to announce a new 39.5mm version of the iconic diver’s watch, designed to appeal to watch buyers who want a stylish, practical, versatile watch that is as comfortable on a scuba diving trip as it is under a shirt cuff. 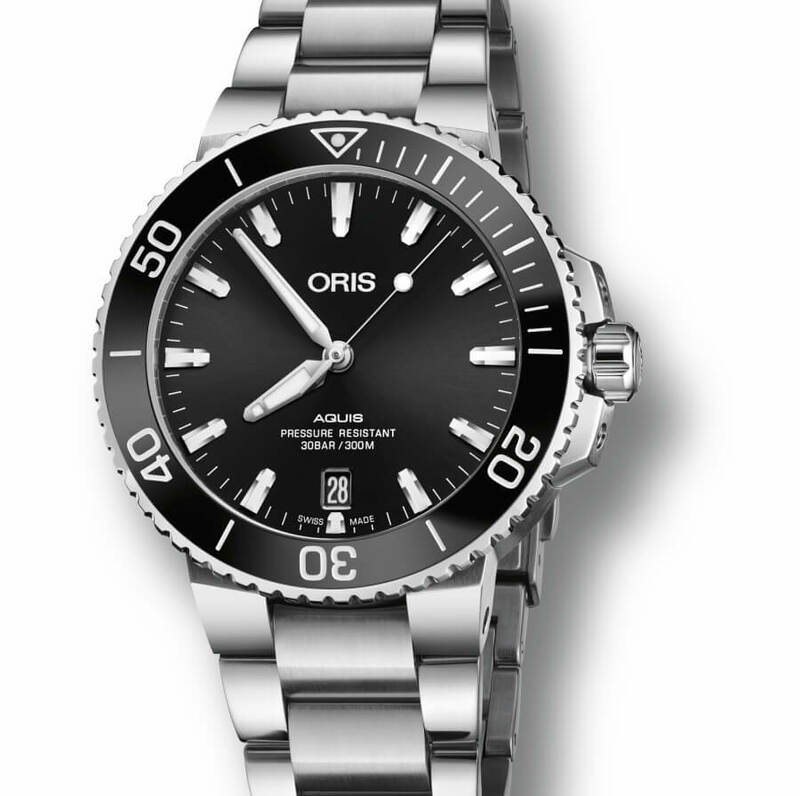 The stylish Oris Aquis is one of the independent Swiss company’s signature designs. Every model in the line combines innovation, high-performance and high-quality Swiss design and engineering with price points that make sense in the real world. The new Aquis Date models come loaded with useful, potentially life-saving technical specifications. The stainless steel case is water-resistant to 30 bar (300 metres) and is equipped with a robust uni-directional rotating diver’s bezel for safely measuring dive times. The bezel has the added benefit of either a polished or matt black ceramic insert. Ceramic is scratch- and fade- resistant, properties that extend and enhance the wearer’s experience of the watch. The high contrasts of the Aquis Date dial have been designed to deliver class-leading legibility. The hands and applied hour markers are filled with luminous Super-LumiNova®, as is the ‘lollipop’ feature on the central seconds hand. Diver’s watches have to clearly display the running of the watch so a diver knows the watch is keeping regular time during a dive, and that their dive time measurements are therefore accurate. This feature delivers additional peace of mind. As with the larger Aquis Date models, the new 39.5mm version has been sensitively designed to be more versatile. 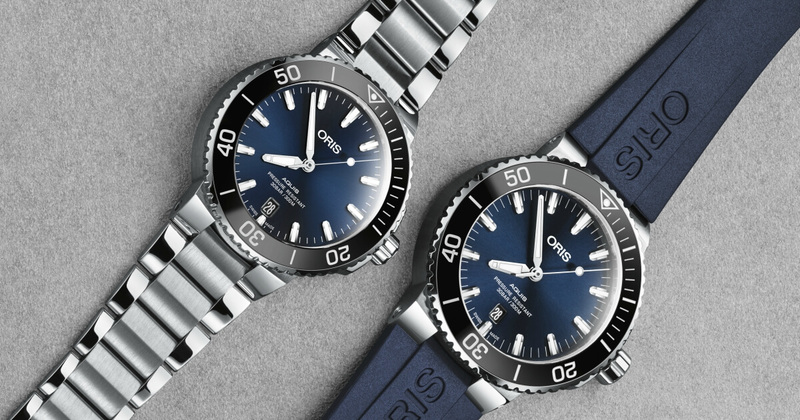 Oris’s designers have given the case an elegant, fluid profile that means not only is the watch practical underwater, it’s also comfortable transitioning to both casual and formal occasions on dry land. 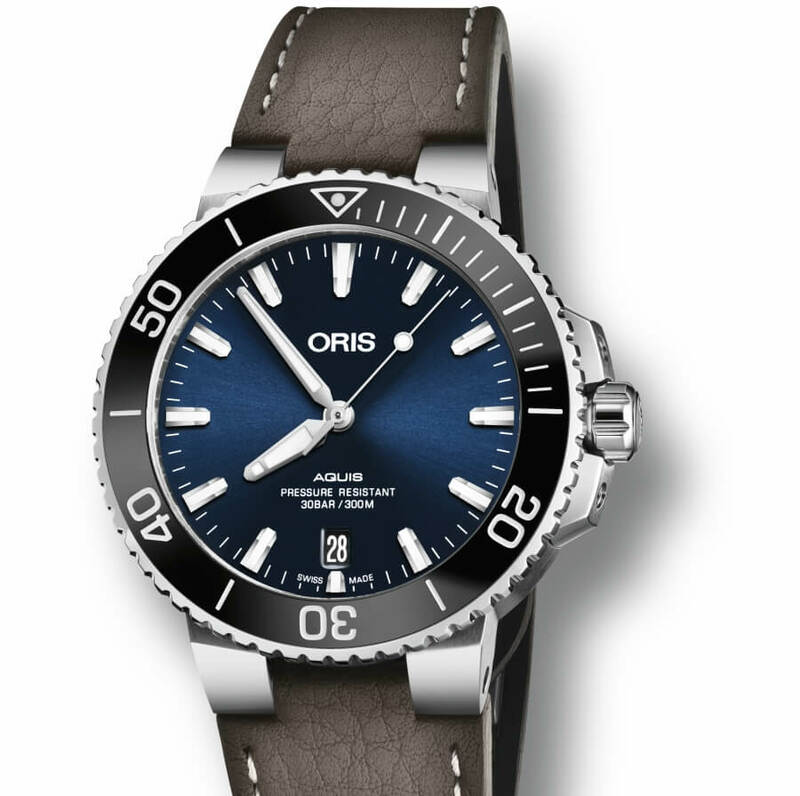 With that in mind, Oris has made the new models available on a variety of straps and metal bracelets, including a dark brown leather strap. Inside the new models is an automatic mechanical movement that provides the watch with a sweeping seconds hand and a date indication at 6 o’clock. Oris has engineered the watch so it can guarantee its water resistance, while also offering a transparent mineral case back, through which the wearer gets a view into the movement’s intricate mechanics. For more visit Oris Online.